This course is included in the 2017 Play Therapy All Access Pass. In this video interview, Theresa Fraser explains the theories behind her Changing Steps program for using play therapy with children in the foster care and adoption system. Participants will learn how play therapy is used with adoptive parents and with children to maximize secure attachment and minimize the risk for placement disruptions. Participants will be able to explain the basic steps involved in using the Changing Steps program for adoptive families including intake, assessment and treatment planning and when/where play therapy is utilized. Participants will identify best practices for using play therapy with children in the foster care/adoption system to maximize secure attachments. Participants will obtain specific play therapy interventions that can be used with children and families in the foster care and adoption systems. Theresa is a certified Canadian Child Psychotherapist and Play Therapist Supervisor. She is also an ordained Minister, a Death Doula, a soon to be certified Birth Doula. Theresa began her career in 1983 when she graduated with honours from Humber College's Child and Youth Worker Program. In 1986 she gained a credential as a Certified Life Skills Coach. She spent the next twenty years working with children and their families in treatment centres, schools and community based programs. She also was the supervisor of a community based adult mental health program until she and her husband began operating group foster homes for the next eight years. She then began working as a Case Manager for a treatment foster care agency. She and her husband continue to foster with this treatment foster care agency today. In 2006 she completed her necessary course work with the Canadian Association for Child and Play Therapy as well as her Level 1 Theraplay training. Theresa has also earned a Diploma in General Social Work, Certificate in Child Abuse Awareness, and B.A. in Liberal Arts from the University of Waterloo. In 2009 she obtained a Master's Degree in Counselling Psychology. In 2008, Theresa was named the Trauma and Loss Clinician of the Year by the National Institute of Trauma and Loss. Her book,Billy had to move: a foster care story was published by Loving Healing Press in Michigan, U.S.A. in 2009. In 2008, Theresa began to attend an International Study group with therapists from around the world organized by Dr. Charles Schaeffer and in 2010 she became a presenter. Also in 2010,Theresa completed her sixth level of Sandtray/ Worldplay which is a Nonverbal Therapeutic approach that is effective with children, teens, adults and families. She also was named Alumnus of distinction by Humber College's School of Community and Social Services. In the fall of 2010 she was voted President of the Canadian Association for Child and Play Therapists and completed her last year in this role in 2015. In 2016 Theresa completing a Certificate in Thanatology(Death and Dying) and a course in Sacred Dying. In 2017 she was certified as a Child and Youth Care Practitioner CYC-P with the North American Child and Youth Care Certification Board. Jennifer Taylor Play Therapy Services is an Approved Provider with the Association for Play Therapy. (APT Approved Provider 12-331). Play therapy credit available to mental health professionals only as listed in each course description. Courses that do not qualify for play therapy credit are clearly listed. 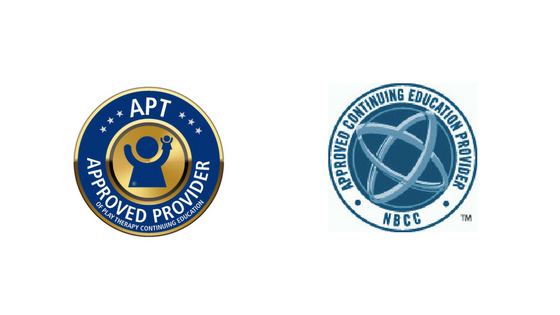 Jennifer Taylor has been approved by NBCC as an Approved Continuing Education Provider ACEP No. 6928. Programs that do not qualify for NBCC credit are clearly marked. Jennifer Taylor is solely responsible for all aspects of the programs.